can be used after accidents. Helps to speed up recovery from knocks, bruises and fights. It can be used before and after operations to assist with healing. It can be given twice daily for up to 5 days following the injury. Stop giving it as soon as the dog seems more comfortable. The drops can be given straight into the mouth. 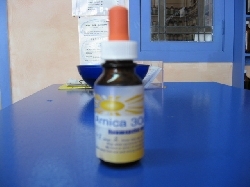 Arnica can be given in conjunction with any other veterinary treatment.